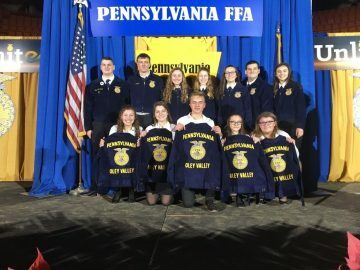 On Monday, January 7, 2019, sixty-five members of the Oley Valley FFA Chapter traveled to Harrisburg to visit the Pennsylvania Farm Show. Members traveled throughout the complex to visit all of the vendors, see all of the animals, and taste all of the different cuisines in the food court. In between the milkshakes, French fries, and potato donuts, however, a portion of the chapter also attended the FFA Midwinter Convention. At the Midwinter Convention, five new members initiated their journey in the blue and gold by receiving their corduroy jackets. These students earned their embroidered jackets through an essay application. Freshmen Addison Arrowsmith, Emily Foose, Autumn Gamler, Brennan Gumeniski, and Julie Weidman received this honor. Three hundred-sixty other students in Pennsylvania were also presented with their FFA jackets for the first time. Also, seven of their senior FFA members became a step closer to finishing their high school FFA careers by earning and receiving their Keystone degrees. The Keystone degree is the highest attainable rank by an FFA member at the state level. The students that earned this rank are Kylee Hetrick, Rachel Noll, Hayden Phillips, Oliver Prout, Josh Treichler, Alysha Ulrich, and Sam Witman. Congratulations to all members that were a part of the Midwinter Convention ceremony this year.